The evolution of the second phase of Sandi Thom’s professional recording career is taking good shape on the evidence of this blistering show at the Robin 2 club in Bilston. Having witnessed her six years before opening for the Dixie Chicks on their last visit to these shores, she was then riding very much on the phenomena of being the face of the Internet music revolution and all the trappings that accompanied those indulgent days. However just over half a decade later and the pop/folk sound has been shelved, being replaced by the influences of blues/rock, with guitar virtuoso Joe Bonamassa becoming a central figure, both career wise and on a personal basis. Having been on the positive side to the reaction of Sandi’s chart topping hit ‘I Wish I Was A Punk Rocker…’, it has to be confessed that her career slipped off the radar in the intervening years. However the re-surfacing of her presence via the Americana music media brought Sandi back into the spotlight of an audience that was ready to embrace her new sound. This culminated in an impressive current release, FLESH AND BLOOD, which is fast becoming a personal 2012 favourite by blending a raw blues edge with a more rounded guitar-led Americana sound to a selection of high quality songs. This new album is the title of the tour currently bringing Sandi back to the UK from her now Californian base and despite recently upgrading her US nationality status; she seems destined to keep Britain, and especially her native Scotland as an important market for her new brand of music. 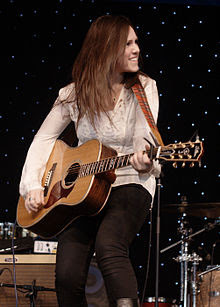 With a more acquired sound than her pop/folk origins, the venues selected on this tour, such as the Robin 2, will be realistic options for her to reach her audience. The reasonable sized gathering for a Wednesday night seized the chance to listen to a live airing of the new record and accompanied by her impressive band, Sandi thoroughly entertained those present in her 90 minute set. A couple of tracks from the new album kicked off the set with ‘Help Me’ and ‘I Owe You Zero’ and ‘Stormy Weather’ also appeared midway through the slot. However the two stand-out songs from FLESH AND BLOOD, featured on the set list were performed towards the end of the evening. The title track, currently being subjected to extra promotional release, closed the main slot with the highly emotional Buffy Saint-Marie song ‘Big Ones Get Away’ providing the perfect antidote to the majority of rock- infused fast paced blues inspired numbers. Sandi does not hesitate to dip into her past and now plays a revamped ‘I Wish I Was a Punk Rocker…’ complete with sax and enhanced guitar. She also makes reference to her time spent in Tooting by dedicating the track ‘The Human Jukebox’,from her debut album, to a wonderful character in a pub who managed to combine excessive alcohol with immense vocal talent. The album which heralded Sandi’s change of direction MERCHANTS AND THIEVES was also represented by a couple of numbers including ‘Heart of Stone’ and the barnstorming ‘Runaway Train’, that ensured the evening ended on a musical high. For this tour, Sandi has assembled a talented band headed by excellent session guitarist Steve Down, who definitely wears his guitar heart on his sleeve. Bassist John Bird and percussionist Craig Connet provide the essential rhythm section while the versatile Mike Flame effortlessly switches between keyboard and sax. Lindsey Cleary supports Sandi with backing vocals while the main lady herself contributes acoustic guitar, harmonica and a voice finding its true home in singing the blues. Blues guitarist and vocalist Lisa Mills, of Deep South origin and residence but with strong West Midlands links, was afforded a lengthy opening slot with the highly experienced and acclaimed Ian Jennings supporting her on double bass. They were fully appreciated by the knowledgeable crowd and were an ideal warm up before the rejuvenated Sandi Thom showed the Midlands concert goers that her musical evolution is progressing very nicely indeed.